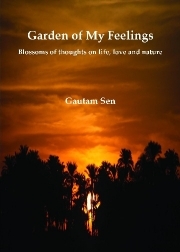 Description of "Garden of My Feelings"
"Garden of My Feelings" is a book of poetry - a collection of poems of author's choice. A mind observes with its keen eyes and gathers experiences which perspicuously give rise to a golden opportunity to understand life and its occult beauty. Thoughts when overflow, mind gets stirred within to analyse life as a whole. There comes the real philosophy of life which is earned and learned by every person at the cost of his own life. This book is a true reflection of the flooding thoughts in author's mind gathered through his vivid exposure to life that has taught him to ponder over the facts and findings at every juncture of his journey through the winding path of his life. Thoughts and feelings expressed here are a kaleidoscopic view of his own philosophy of life. With a certain hope that it would bring a blissful enlightenment to the readers' mind and would made them think, would open out new windows of vision, this book is published. In true sense it is the garden of author's feelings. A free lancer, writing poetry is his first love. He has been writing in different online poetry sites, like fanstory.com, poemhunter.com, ndtv.com and so many others. A regular contributor in different magazines also. Recently he has started his maiden attempt in writing a novel. His main aim to win the readers by opening out a new vision of life by his thoughts and feelings on life. He is sure he will. Reviews of "Garden of My Feelings"